Doris Newman recognizes that people have a deep discontentment in the world. 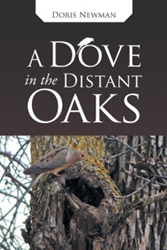 In her published book “A Dove in the Distant Oaks” (published by WestBow Press), people may know that contentment is possible despite the ups and downs of life. Set in a farm in South Dakota, the book follows Dianna, a little girl who becomes an adult. She spends her life looking for contentment. She looks to her father as an example. She looks to the circumstances of life. Ultimately she finds contentment inside of herself. The bus driver turned down the volume of the classic radio station and drove back to Dianna’s farm and up to the house. Tears streamed down Dianna’s face. Her mother came out of the house and Frank, the bus driver told her about the burn, while Dianna was placed into the backseat of her parents’ car. Doris Newman was born to a farm family and grew up on a farm in Northeast South Dakota. Her variety of experiences in the parsonage uniquely enable her to write on this subject. Newman graduated from South Dakota State University. Along with her husband, Tim, they served churches in South Dakota, Minnesota, Florida and Illinois. WestBow Press is a strategic supported self-publishing alliance between HarperCollins Christian Publishing and Author Solutions, LLC — the world leader in supported self-publishing. Titles published through WestBow Press are evaluated for sales potential and considered for publication through Thomas Nelson and Zondervan. For more information, visit http://www.westbowpress.com or call (866)-928-1240. For WestBow Press news, click “Like” at http://www.facebook.com/WestBowPress and follow @westbowpress on Twitter.